The owners of Wemyss Bay ferry terminal are prepared to implement 24/7 working to make sure the facility is ready to reopen to the Rothesay ferry service by the Easter weekend. Brian Sydney from Caledonian Maritime Assets Ltd (CMAL) said the company had identified additional resources to be called upon if needed to ensure the pier, which has been closed since October for major repairs, is able to return to use by Friday, March 25. 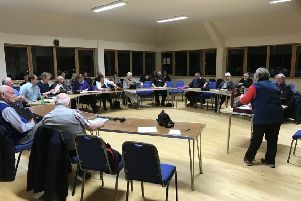 Speaking at the latest drop-in session to update Bute residents on the work, Mr Sydney, the civil engineer in charge of the project, said the main concern, with little more than a month of the project to go, was to ensure repairs to the pier’s vehicle linkspan - taking place on the quayside at Inchgreen in Port Glasgow - were completed on time. The linkspan work was held up when the high winds of Storms Gertrude and Henry in late January and early February damaged the temporary ‘containment structure’ set up on the Inchgreen quay to protect the structure from the winter weather. “We’re fairly comfortable as far as the work at Wemyss Bay itself is concerned,” Mr Sydney said on Thursday evening, “but the linkspan is what’s causing us a little bit more angst. “However, we’re aiming to sail the linkspan back to Wemyss Bay on a barge on March 12 or 13. We’ve identified additional resources, should we need them; we’ve already implemented seven-day working at Inchgreen, with five nightshifts a week, to make sure it’s done in time; and if necessary we will put on three shifts and work 24/7. CMAL announced earlier this month that the completion date for the work had been put back five days until March 23 - two days before the start of the Easter weekend and the beginning of CalMac Ferries’ summer timetable. * More in the next issue of The Buteman - on sale from Thursday, February 25.